Back again with another post this evening- Hope all of you are well this evening. I wanted to get in a post for you all before heading to bed. It seems I have a pattern lately. I am posting before heading off to bed. I tell ya- it seems that is the only time right now that I have to do it- **oh**, but it brings me so much joy. I am not sure who all follows me on here regularly- but I always wanted to post fresh new things, regardless if it is one, or 100 people reading this blog. I would like to revisit a previous post I did around the holidays- because I didn't get any feedback good or bad on "Who's my audience". I am still curious to know who all of you are, and who reads and follows my blog. I will leave that for another night though. I did a few "tests" if you will on my camcorder this afternoon, and my hope is I will have a full complete video to share with you in the next two weeks. I need to get some conversion lenses for my Creative Vado HD camcorder so I may do videos that I have to focus real close so you can see my cards, and if I do haul videos, you would be able to see what I get from time to time, and the details of the haul. I have to get a macro lens for that, so I am looking into that. 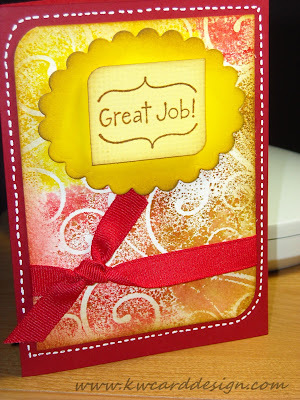 OK- enough of the blabbing on- how about a colorful card! !